In a food processor, combine chickpeas, onion, garlic, parsley, coriander and cumin. Pulse until finely ground but not pureed. Pour mixture into a large bowl and add 2 tbsp flour, salt, pepper and baking powder, if using. Use a spatula to stir in ingredients. Shape a piece of the mixture into a ball to see if it holds together; if not, add more flour until mixture is slightly wet but holds its shape. Cover bowl with plastic wrap and freeze for 1 hour, or refrigerate for 4 hours or overnight. Preheat oven to 400°F and line a baking sheet with parchment paper. (If frying, heat 2 inches oil to 350°F in a large saucepan). 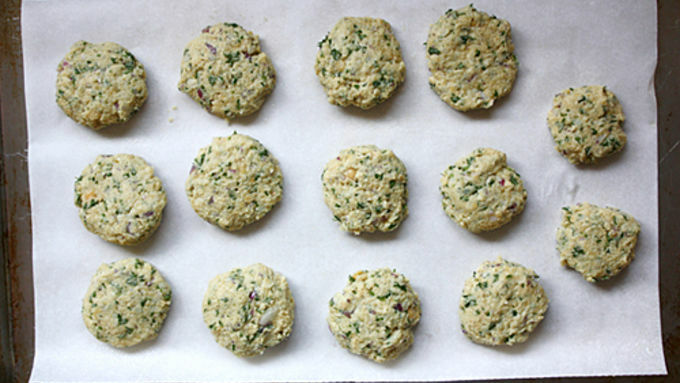 Remove mixture from freezer or refrigerator and shape into 12 to 14 balls. If baking, slightly flatten balls, spritz each side with olive or vegetable oil and place on baking sheet and place in oven. Bake on each side for about 15 minutes for 30 minutes total in the oven. If frying, slowly lower balls into hot oil with a slotted spoon and fry until golden brown, about 5-7 minutes. Place each ball on a paper towel-lined baking sheet to drain excess oil. 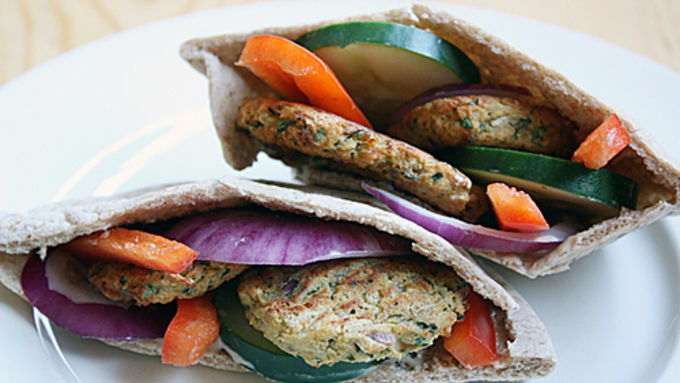 Serve falafel in pita sandwiches with tahini or yogurt sauce and your favorite veggies. I’ve drooled over falafel ever since I first tried it while studying abroad in Amsterdam. I wish I could say I tried it somewhere more, well, authentic. But the truth I had falafel for the first time as a midnight snack with some French fries (OK, more like a second dinner). Nothing like a culinary trip across the world! Since that inaugural experience with falafel, I’ve been trying to recreate the perfect recipe at home. It hasn’t been pretty. I don’t know what was in those falafel bites I had overseas, but I’ve never even come close to the density and flavor of my first experience. Sigh. Maybe nostalgia has clouded my ability to compare. In any case, I’m not at all disappointed with the version I’ve drummed up at home. This Baked Falafel sandwich is delicious in its own right, and much healthier than the deep-fried version. It’s dense and filling and incredibly flavorful – perfect for a Meatless Monday dinner. This recipe is versatile, so if you just can’t get enough of the deep-fried version, you can make this same recipe and just fry it in hot oil instead of putting it in the oven. 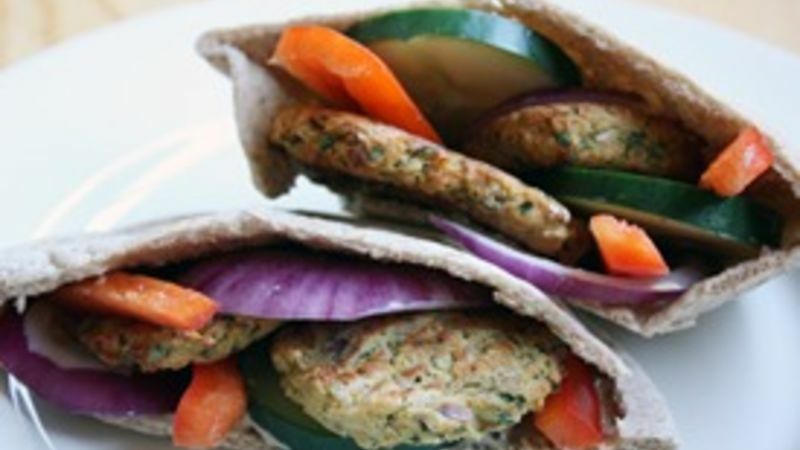 In either case, these falafel bites taste great stuffed in a pita with tahini sauce and your favorite fresh veggies. And they taste even better with a side of French fries!